We’re changing the way we calculate add-on usage statistics on AMO so they better reflect their real-world usage. This change will go live on the site later this week. The user count is a very important part of AMO. We show it prominently on listing and search pages. It’s a key factor of determining add-on popularity and search ranking. We count both enabled and disabled installs. This means some add-ons with high disable rates have a higher ranking than they should. It’s an average over a period of several weeks. 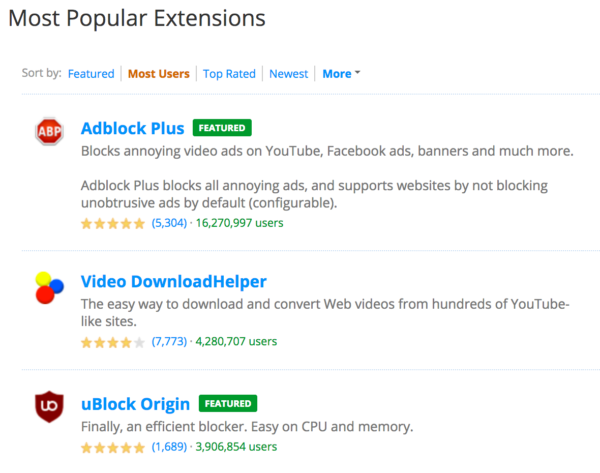 Add-ons that are rapidly growing in users have user numbers that are lagging behind. We’ll be calculating the new average based on enabled installs for the past two weeks of activity. We believe this will reflect add-on usage more accurately. We expect most add-ons to experience a small drop in their user numbers, due to the removal of disabled installs. Most add-on rankings on AMO won’t change significantly. This change also doesn’t affect the detailed statistics dashboard developers have access to. Only the number displayed on user-facing sections of the site will change. If you notice any problems with the statistics or anything else on AMO, please let us know by creating an issue. Usage number for themes will fall hard, and they are “most” of the add-ons, no? Lightweight themes are the majority, yes, but their usage stats are calculated separately. They won’t be affected by this change (I failed to mention that). Usage for complete themes will fall significantly, though, but there aren’t many active themes now. Regarding disabled add-ons, yeah, that’s a good policy – and one of the ones in your screenshot used to be a good example of why. The current versions of VDH are pretty good, but I had a lot of problems with memory leaks in earlier versions, such that it was safest to leave it disabled 99% of the time, and turn it on only when I wanted to use it.